New Year and New Book for Amanda Murphy! As the year comes to a close and we wrap up the UFO’s of 2012 (or simply carry them over), BERNINA Sewing Celebrity Amanda Murphy prepares to launch her new book! Amanda is a WAS Expert and designs her own pattern line at Amanda Murphy Design. She has also designed several fabric collections for Robert Kaufman Fabrics and most recently for Blend Fabrics. Amanda has been designing, drawing, and sewing since she was a little girl. She recieved an BFA in Design from Carnegie Mellon University, then moved on to work as a graphic designer and art director in Alexandria, Virginia and New York City. Amanda discovered that quilting married her passion for design with her enthusiasm for handwork. 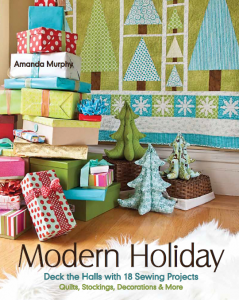 This coming year in June, Amanda will launch her book Modern Holiday (published by C&T), featuring 18 holiday decorating projects from quilts to stockings and more. Decking the halls has never been more fun! And get this… all projects were sewn on a BERNINA 580 E! Looking for holiday inspiration right now? Here is a video of Amanda using the DesignWorks software to “paint” and embroider… this time, with the B 780E! Keep up with Amanda by joining her Facebook page and following her Twitter and Pinterest.